Hypoglycemia is an increasingly recognized complication of bariatric surgery. Mechanisms contributing to glucose lowering remain incompletely understood. We aimed to identify differentially abundant plasma proteins in patients with post-bariatric hypoglycemia (PBH) after Roux-en-Y gastric bypass (RYGB), compared to asymptomatic post-RYGB. Proteomic analysis of blood samples collected after overnight fast and mixed meal challenge in individuals with PBH, asymptomatic RYGB, severe obesity, or overweight recruited from outpatient hypoglycemia or bariatric clinics. The top-ranking differentially abundant protein at 120 min after mixed meal was fibroblast growth factor 19 (FGF-19), an intestinally derived hormone regulated by bile acid-FXR signaling; levels were 2.4-fold higher in PBH vs. asymptomatic post-RYGB (mean + SEM, 1094 ± 141 vs. 428 ± 45, P < 0.001, FDR < 0.01). FGF-19 ELISA confirmed 3.5-fold higher concentrations in PBH versus asymptomatic (360 ± 70 vs. 103 ± 18, P = 0.025). To explore potential links between increased FGF-19 and GLP-1, residual samples from other human studies in which GLP-1 was modulated were assayed. 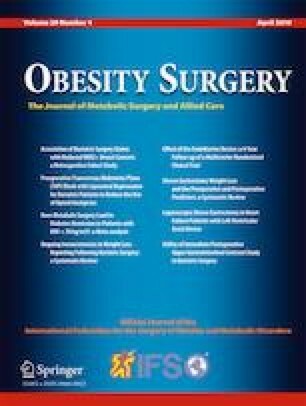 FGF-19 levels did not change in response to infusion of GLP-1 and PYY in overweight/obese individuals. Infusion of the GLP-1 receptor antagonist exendin 9–39 in recently operated asymptomatic post-RYGB did not alter FGF-19 levels after mixed meal. By contrast, GLP-1 receptor antagonist infusion yielded a significant increase in FGF-19 levels after oral glucose in individuals with PBH. While plasma bile acids did not differ between PBH and asymptomatic post-RYGB, these data suggest unique interrelationships between GLP-1 and FGF-19 in PBH. Taken together, these data support FGF-19 as a potential contributor to insulin-independent pathways driving postprandial hypoglycemia in PBH. The online version of this article ( https://doi.org/10.1007/s11695-019-03845-0) contains supplementary material, which is available to authorized users. We thank the authors of references [13, 14] for providing surplus plasma samples from these studies to measure FGF-19. We would also like to acknowledge support from the Joslin Clinical Research Center and thank its philanthropic donors. This study received research grant funding from the American Society of Metabolic and Bariatric Surgery and Medimmune (both to MEP), a pilot award for plasma proteomic assay from SomaLogic (to MEP), T32 DK007260 and Hearst Fellowship (to CMM), American Diabetes Association 7–13-CE-17 (to ABG), RC1 DK086918 (to ABG), R56 DK095451 (to ABG), and P30 DK036836 (Joslin DRC). This work was conducted with support from Harvard Catalyst|The Harvard Clinical and Translational Science Center (National Center for Research Resources and the National Center for Advancing Translational Sciences, National Institutes of Health Award UL1 TR001102). NNF Center for Basic Metabolic Research, University of Copenhagen, NNF application number: 13563 (Novo Nordisk Foundation, Denmark), EliteForsk Rejsestipendiat (2016), The Danish Council for Independent Research (DFF–1333-00206A), European Research Council (Grant no.695069), Augustinus Foundation, and Aase og Ejnar Danielsens Fond. The following are the Stanford study funding sources: KL2 TR 001083, UL1 TR001085, and L30 TR001569-01 (to CMC), and a Fellow Pilot Award from the Stanford Translational Research and Applied Medicine (TRAM) Program of Stanford University School of Medicine (to CMC). Dr. Patti has consulted for Eiger Pharmaceuticals; has received investigator-initiated grant support from Janssen Pharmaceuticals, Medimmune, Sanofi, Astra-Zeneca, Jenesis, and Nuclea; has been a site investigator for XOMA; and acknowledges clinical trial research trial product support from Ethicon, Covidien, NovoNordisk, Nestle, and Dexcom within the past 5 years. Dr. Patti and Dr. Goldfine disclose a patent application for plasma proteins contributing to hypoglycemia. Dr. Mulla, Dr. Dreyfuss, Dr. Houten, Dr. Pan, Dr. Pober, Dr. Wewer Albrechtsen, Dr. Svane, Dr. Schmidt, Dr. Holst, Dr. Craig, and Dr. McLaughlin declare no potential competing interests. Argmann CA, Houten SM, Champy MF, Auwerx J. Lipid and bile acid analysis. Curr Protoc Mol Biol. 2006; Chapter 29:Unit 29B.2. https://doi.org/10.1002/0471142727.mb29b02s75. Team RDC. R: a language and environment for statistical computing: R Foundation for Statistical Computing; 2007. https://www.r-project.org/about.html.